Many people today have decided to skip waiting for court time at a club and build their own private tennis court on their private property. Tennis court construction is a learned art and must be constructed by professionals that know how build it properly. It is imperative to find professional tennis court builders who know the area and environmental requirements for this type of project. Hal’s Construction has loads of experience building tennis courts both for both private individuals and commercial entities in the Portland Metro area. 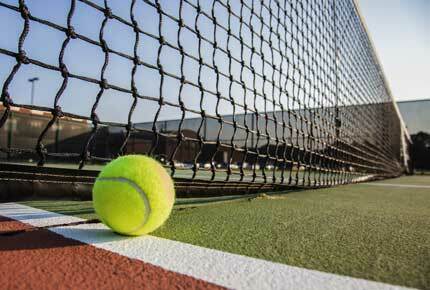 We will analyze your property to determine the type and size of tennis court that will work best for you. We will inspect and install the proper drainage system and foundation required to keep your tennis courts level and free of pooling water. This will help keep your tennis court in the best playing condition for years to come. If you enjoy playing tennis at night, we will install outdoor lighting. As long as you have electricity to the site we can install a speaker system. Most tennis courts need to be fenced to keep in stray balls, however some courts require the ability to be locked when the tennis court is not in use. Hal’s construction is well known for their paving division. We can provide walkways and sidewalks to your court and a parking area if necessary. Hal’s Construction’s expert design team will help you map out what is needed to build you your custom outdoor tennis court of your dreams. Specific environmental and climatic needs significantly impact the planning and construction of any sports facility. Hal’s Construction knows the challenges and understand the lists of state and local legal requirements affecting the building of a custom outdoor tennis court. Soil at the site of the tennis court construction area has a strong influence on the development of a well-made tennis court. Their studies will identify soil properties and texture that is beneficial to provide proper drainage. Dependent on the characteristics of the soil found, the team at Hal’s Construction will know what to expect when excavating for the foundation and leveling the court’s surface. In the leveling process, the proper angle of slope is established for proper water drainage. Whether building a new tennis court or resurfacing an existing court, tennis court construction requires a pro’s expertise.